Jon Bonné, the NY ex pat who moved to SF to write about wine for many years, then moved BACK to NY to get married, has penned an opus to a rising-star wine region – Germany’s Baden-Württemberg and W. Bavaria – a region collectively known as Swabia. Now, most of my education in the German language is limited to grape varieties, soil types and the tongue-twisting words commonly found on complex German wine labels. Such a basic facility with the language suggest the region’s pronunciation should be “SVAH-bia”. But Google is of little help in providing confirmation of my tentative suggestion. From Google can tell, the English pronunciation is “SWAY-bia”, while the German pronunciation is “SWAH-bia”, with a short A but still pronouncing the W. I’m surprised the W isn’t pronounced as a V, but then, perhaps Google just doesn’t know everything (shocker). I hope an astute German-speaking reader will comment and I can erase this confusion in a revised posting. But what’s in a name? The wines of Swabia by any other name would taste as sweet. Wait, these are dry wines, so I need a better Bardian reference, but you get my drift. The key thing is to read Jon’s article, then go out and buy some of these wines to taste for yourself. They are lighter than their new-world counterparts, but I hesitate to use the term “Burgundian” as they are unique unto themselves. Yet given their Burgundian origins, it’s no surprise that the German word for Pinot Noir (the flag-bearing varietal from the region) is Spätburgunder, which roughly translates as “the late-ripening grape of Burgundy”. And though Jon emphasizes the red wines of Swabia, it’s worth noting that the white wines are also of great interest to wine lovers – try the curiously named “Gutedel” (GOOT aid-uhl, as in edelweiss), a white variety also known as Chasselas (SHA salahh) which is worthy of note because it has not yet to be discovered by hip millennial wine bars (aka it’s still affordable). And the Swabian Pinot Gris (Grauer Burgunder), which may be a bit higher priced but is equally and uniquely charming. Amazon describes this book as “The #1 Best Seller” in their Wine Collecting category. Do I really need to say more? What can I add that the intelligence of the collective community hasn’t already said by voting with their credit cards? Just my opinion, I guess. Which one might see as sycophanitc burbling. You see, this book is utterly charming. Informative but not pedantic. Fun and enjoyable to read. It is not the ONLY wine reference book you need, but it is certainly the first one to buy – the cornerstone for any wine library. My only gripe is minor – some topics can be a tad difficult to find, as the book is organized by country/region and (at least in the advance copy I received) has no index. This makes researching a grape variety very difficult to do if using the paper version of the book, which lacks the convenience of electronic search capabilities. BUT, for those buying a paper version, I recommend the hard cover as you’ll use it often and your increasingly well-thumbed softcover version will need to be replaced all too soon. But the biggest surprise to me was Karen’s warmth and lightness of tone. Her obvious enthusiasm is shared with brevity and the perfect ratio of images to text, and does so without ever tiptoeing into the “look how smart I am” territory. You see, I’ve never taken a class from Karen, but I’ve met her several times and have one of her wine education video series, and she strikes me as one who is (hmmm, how do I put this?) “very precise”. Like someone whose parking meter change is organized by coin size. Whose floor-to-ceiling library is organized alphabetically. Whose clothes somehow are never marred by coffee consumed from a leaky to-go cup on the way to her office. And whose writing style would lean towards the deeply informative while eschewing the engagingly captivating. I may or may not be right about the first three, but I am very pleased to be wrong about my last conclusion! You’ll enjoy this book, over and over again! I’ve long thought Prosecco to be the nectar of the gods. I mean, whatever the gods were drinking (at least the Italian gods), it just had to be Prosecco. I can’t think of a tastier drink (next to champagne, which I also adore) that complements so many dishes, yet can also stand alone. Still, what makes Prosecco so special? What do we really know about Prosecco, you ask? Prosecco was not always the name of the beverage. It was the name of the variety of grape. Duh. Ok, I didn’t know that either. The name of the grape variety was changed to “Glera“. In order to be labeled Prosecco, the wine must be made in a region or regions labeled as DOC (Denominazione di Origine Controllata). Atop the DOC regions is the epitome of all Prosecco, those from Conegliano Valdobbiadene Prosecco Superiore (DOCG). Most Prosecco today is extra dry (DOCG). Asti and Moscato D’Asti should not be mistaken for Prosecco. They are sweeter. The Bellini (Prosecco and pureed peach) originated at Harry’s Bar (an old watering hole of Ernest Hemingway) in Venice. A Rossini is another fruity Prosecco cocktail I think you’ll enjoy. Simply pour Prosecco into a flute with pureed baby strawberries. Other variations: the Puccini – Replace peach puree with mandarin juice. And then there’s the Tintoretto – replace with pomegranate juice. Fancy! Prosecco is a libation that does not age well. So upon opening the bottle, drink at once! Catie Costa has traveled all over Western Europe, with repeated trips to Ireland and Italy. She currently lives in the San Francisco Bay area. She recently published a new fiction novel, “Love on the Rocks: A Positano Tale,” a story of two best friends, Kit and Bridget, who flee their humdrum lives in the States to spend an adventurous summer in Positano, Italy, where Prosecco, Nutella and romance abound. Phot credit – Food Lab, a great recipe source! I’ve known how to make great seared chicken breasts for many years, but always found the sauce too thin and runny, even when I allowed extra time for reduction or finished with an extra dollop butter. But when I ordered the same dish at a decent restaurant, the sauce was always beautifully thick and satisfying. So I asked if the chef would share his/her secret. Here’s what came back – add gelatin! I tested it, and then googled it and found the Food Lab’s recipe (click image above to open in new window), and compared both versions. I share the highly satisfying result with you here. One boneless chicken breast per person (this assures leftovers) – I prefer skin on – allowed to dry in refrigerator for at least four hours, or overnight. With oven rack placed at center height, pre-heat oven to 450. Liberally season chicken breasts with salt and pepper. Combine wine and chicken stock and sprinkle gelatin on top. Set aside. Heat a wide, flat, oven-proof skillet (stainless steel, if you have it) over medium high for 3-4 minutes; add the oil and then the chicken breasts, skin-side down. RESIST touching the chicken for about five minutes, then check on progress – flip the breasts when the skin is deep golden brown, usually about six minutes if your heat is right. After flipping, transfer your skillet to the oven. When a thermometer (inserted into the thickest part of the chicken breast) registers an internal temperature of 150 degrees (6-10 minutes, depending on the size of the poultry), place the skillet on a burner and transfer chicken to a cutting board to rest before carving. Pour off all but ~1 Tbsp of chicken fat from the skillet, then set your fire to high heat. Add the shallots and garlic and stir until fragrant – just 30 seconds or so. Add the stock/wine/gelatin mixture and deglaze the pan, stirring up any of the fond – the brown bits from the chicken. Reduce by 2/3 (4-6 minutes, depending on your heat) then finish your sauce by whisking in the butter and soy, cooking for several seconds at a high boil until emulsified. Remove from heat, stir in the minced herbs, and add any salt/pepper to taste. Slice the chicken breasts into ¾ inch slices and transfer the whole breast to individual plates, overlapping the slices before spooning on the sauce. Serve with choice of potatoes and green vegetable. Difficulty: Easy-Medium. Time required: 45-60 minutes, depending on wine consumption. Wine Pairing: This dish is rich enough to compliment medim-full bodied white wines, most Rosés, and even light reds such as Pinot Noir, Sangiovese or lighter Zins. Variations: this basic recipe can be taken in a million different directions. Think about adding sautéed mushrooms to pull it in an earthy direction, or dried cherries/cranberries for a sweet/savory direction. Pound out the breasts and add lemon and capers and you’ve got Piccata. Or add a bit of cumin, raisins and pine nuts and head towards Morocco! As a rule, my wine club features unique wines. Wines from more obscure producers, grape varieties, and regions. But every now and then a member will ask why I don’t include some of the old familiar wines, wines of their youth, perhaps. So I’ve come to include a mix of wines, including the occasional Napa selection from smaller producers like Four Cairn, Midsummer Cellars, and Cathy Corison. In general, after reviewing wines from around the globe, I just don’t see the value in traditional Napa Cabs, unless your goal is to hold them for future sale (only problem is, few Napa producers are crafting wines to age these days!) Don’t get me wrong, they still have great appeal, just not great value. 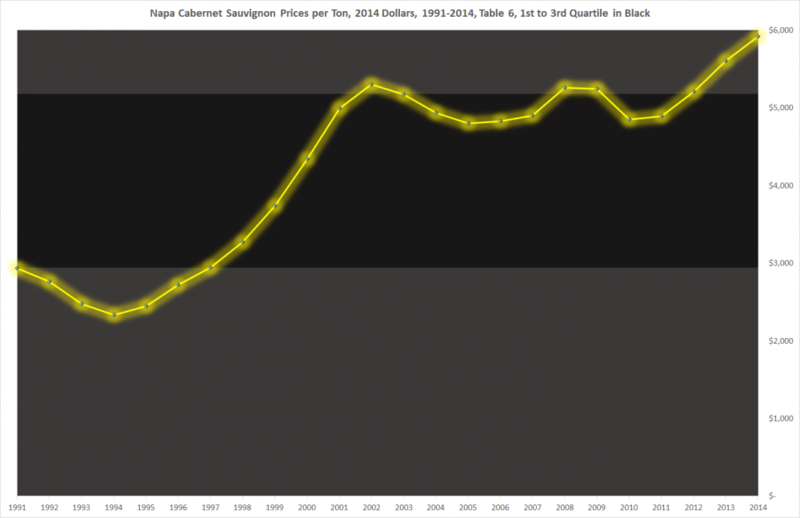 And this chart explains why – adjusted for inflation, Napa Cabernet grapes are at an all-time high of nearly $6,000 a ton! Having learned my lesson the hard way (it’s a long sob story not worth any more pixels), I appreciate good wine apps. I recently came across Bryan Petro’s “CorkSharing” (wine tourism app for iPhone and Android) and thought it worth sharing. CorkSharing was designed for those who like to plan their route in advance and who enjoy a little preferential treatment upon arrival. The app allows users to visually scan a map of a wine region showing an overlay of participating wineries. Users can then click on a winery’s red dot to review their self-reported details and, if all looks good, to book a tasting appointment. From a winery’s perspective, the app automates the reservation process, from booking the appointment to taking payment for the tasting fees (CorkSharing takes a 15% booking fee – there is no other cost to participate). The company currently has more than 600 participating wineries from around the globe. If you run a winery tasting room and would like to test CorkSharing, sign up for it here. Holding a tasting event you want to publicize? Post it here. My vision for our failed iPhone app was to allow wineries to book reservations, as CorkSharing does, but also to push promotions to users once their device was within a reasonable distance. Imagine a slow day in your tasting room, and the ability to post an instant promotion of limited duration. Generating more TR traffic for you, and providing greater value for customers seemed like a great deal. CorkSharing gets you much of the way there, and seems a likely candidate among wine apps to go the distance. However, they desperately need more wineries on board before the app reaches critical mass, and they are constantly working on this. Unlike other apps, they don’t scrape data from winery websites in order to create the appearance of endless choices (only to disappoint users who click on winery after winery not participating in the booking). The app is free and easy to use. Even at this early stage it’s worth downloading. Any wine lover planning their next trip will find it useful!